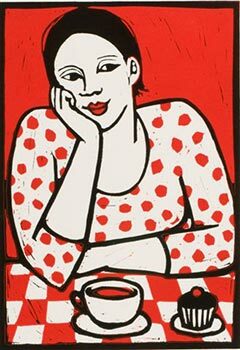 One of the UK’s most prominent and successful artists, Anita is both painter and printmaker and her works which depict her family life have received broad acclaim. 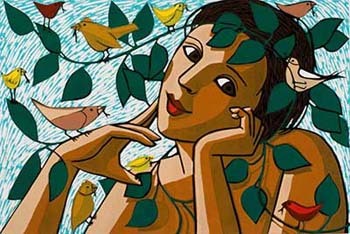 She uses a variety of printmaking techniques, including etching, drypoint, lithography, linocut and woodcut. Information on these can be seen at Original prints.. 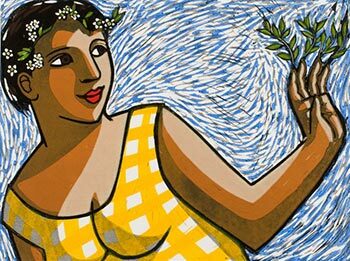 The smaller limited edition woodcut prints and etchings by Anita Klein, past-President of the Royal Society of Painter Printmakers. Anita Klein's medium-sized original prints. “At a time when the art world seems to be full of artists attempting to shock and denigrate, Klein’s intimate, life affirming work comes as a welcome breath of fresh air. Her works convey a unique pleasure in the everyday moments that make life special”. Vincent Eames. Anita Klein's large-size works on paper. "It is nice to have a real humorist recruited to the ranks of gifted painters. She is to be congratulated on livening up our dreary lives.” -Art Review.